Welcome to The New England! 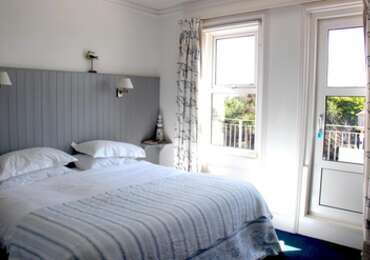 Conveniently located on Eastbourne Seafront and only 15 minutes walk from the Pier, we are a Guest Accommodation with a contemporary US East Coast maritime feel. Take in the views from our ocean front Breakfast Room and relax in our comfortable Guest Lounge. Spoil yourself with our Full English Breakfast or a selection from our buffet table. All our rooms are en-suite with bath tubs, comfortable mattresses and tea and coffee making facilities. All have flat screen TV with FreeView digital channels. Wifi is free and available throughout the property. Come stay with us and we will endeavour to make your break memorable! FOR BEST PRICES BOOK DIRECT ON OUR WEBSITE - FREE CANCELLATION AND FULL REFUND UP TO 7 DAYS PRIOR TO ARRIVAL. 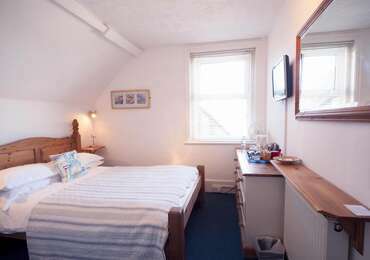 This Double or Twin room is en-suite, with bath tub and power shower. This en-suite room with bath tub and power shower is situated on the second floor. It has one double bed, a couple of comfortable chairs and a coffe table. It sleeps a maximum of 2 people. It is rear facing and has a South Downs view. 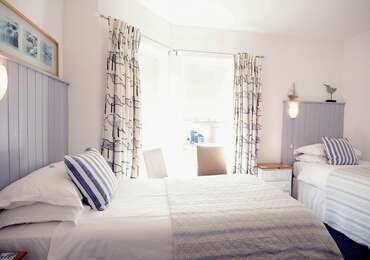 This en-suite room with bath tub and power shower, has one king size bed or two single beds. It is located on the first floor, with a private balcony and beautiful sea views.